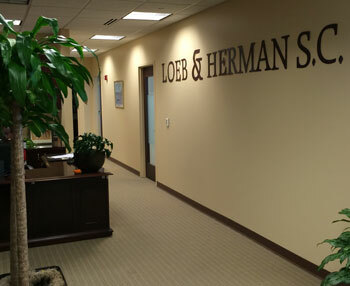 The law offices of Loeb & Herman, S.C. has its roots in a law firm that was started early in the 20th Century. That law firm was Glicksman & Gold. Firm became known as Gold & McCann. In 1953, Leonard L. Loeb was discharged from the Air Force Judge Advocate General Corps. He was hired by Gold & McCann in December of that year and began work with the firm in February,1954. Atty Loeb lived for much of his childhood in Columbus, WI. He moved to Milwaukee in the mid- 1930’s and attended Sullivan High School in Chicago during WWII. He graduated in 1947 and went on to the University of Wisconsin. He received his Bachelor’s Degree in Business Administration in 1950 and his law degree from UW in 1952. He then accepted a direct admission into the Judge Advocate General Corps of the Air Force as a 1st Lieutenant. Loeb was discharged at the end of the Korean Conflict and joined the offices of Gold & McCann. When Gold retired in 1954 the office became The Law Offices of Ray T. McCann where Atty. Loeb served as an associate until 1973. Leonard L. Loeb, S.C. was established in 1973 and engaged in general civil litigation with an emphasis on family law. The practice ultimately evolved into exclusively family law and remains so today. At the inception of the firm of Leonard L. Loeb, S.C., Sharon A. Drew, who had been Atty. Loeb’s Legal Assistant at the Offices of Ray T. McCann, joined Loeb as his assistant in his sole practice. Sharon ultimately obtained her undergraduate degree from Alverno College and enrolled in Marquette University Law School while she worked at the firm. She obtained her law degree and joined the law firm as an Associate. In the meantime, Atty Loeb hired Gregg M. Herman in 1984 as an associate. Gregg is a life-long resident of Wisconsin, including graduating from UW- Madison in 1974 with an honors degree in history and from UW Law School in 1977. After being admitted to the bar, Gregg served as an Assistant District Attorney for Milwaukee County, prosecuting cases ranging from misdemeanors, white collar crime, drug trafficking and general felonies including armed robbery and First Degree Murder. In 1991, the firm became Loeb, Herman & Drew, S.C. Ultimately, Sharon decided to focus her practice in the area of mediation. As a result, she established an independent practice and remains a trusted friend of this firm. The firm’s name was changed to Loeb & Herman, S.C.
After Leonard passed away in 2003, the name remained as a tribute to one of the finest lawyers and human beings on the face of the earth.